Last Saturday (May 14, 2016) the WD9BSA VE team held our second licensing exam of the year. We had ten people attend the test session at the Golden Burke Scout Center in Indianapolis, IN that morning. Fortunately, we had nine VEs present to administer the tests and handle the other various duties required to pull off these events. This is a pretty large group for us, but word is getting around that our exams are free through the Laurel ARC VEC. A hearty congratulations to all the new ham and those with new privileges. Many thanks to the VE team who volunteered their time on a Saturday morning: KB9BVN, W8ISH, KJ9B, KA9ZYL, W9THR, NF9K, W9FG, AC9HP, and K9WTH. Until next time, 73. Seems there has been much buzz lately in the Council regarding the WD9BSA station. That’s an especially good thing when it’s of a positive nature. There have been several requests made of the station regarding potential amateur radio exposure to Scouts and the public. We’ve been offered a chance to setup a station at the Indiana State Fair this summer. I know the Council has a display/presentation area there every year. This would be an excellent PR opportunity for bringing the ham radio message to both Scouts and the public. At this point I don’t know details of how many days we would be obligated to attend or how many hours each day. This is an item definitely worth discussing among the members and other friends of the station. Of chief importance would be having Scouts participating and operating there, not just adults. I believe logistics would be another concern. Many of us are still working full time jobs and may not have days off available then. Scout volunteers would also need parents to transport them to the fairgrounds if they’re not driving yet. A second request had been made to support two different BSA summer camps. Another opportunity to show off the capabilities of amateur radio as a public service, emergency preparation tool, intro to technology, and a hobby. Again, I can’t offer specifics regarding how many days we would be obligated to. Same concerns as before, I would think. Although this would probably be mostly adult presenters as the Scouts would actually be attending camps, etc. So, give this some thought. This info has also been posted over on the WD9BSA Facebook Group and there’s already been some suggestions and discussion. I think this could be a real PR gift for the station, but we need all-in participation commitments to pull it off. This is an open invitation to join the WD9BSA weekly Scout net. Participation has been growing and is open to operators holding any license class. Checkins begin at 7:30 PM local time Monday evenings. Just tune your radio to the 443.000 MHz 70 cm repeater and set it for + offset and 100 Hz CTCSS tone. The Scout net is a great place for new hams to learn net operation procedures and communicate with fellow Scouts. Come say hello and make some new friends on the air! 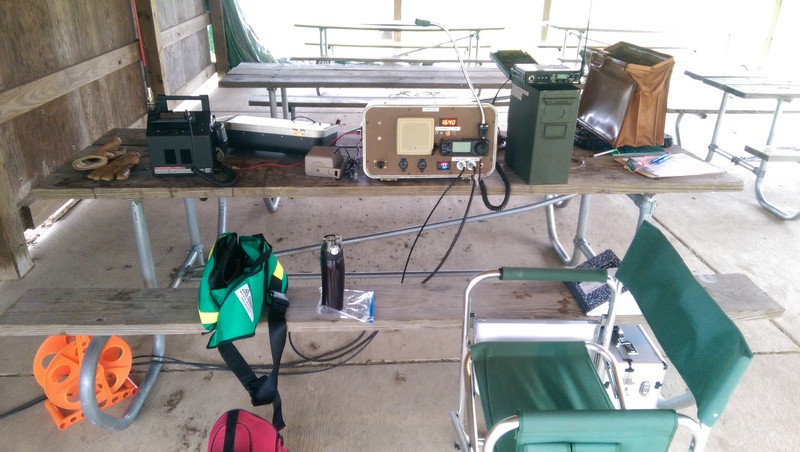 This past weekend (Nov 8-9) we had the opportunity to bring Scout radio to many new people. In order to accomplish this we had to split up the WD9BSA regulars. The activities started Saturday morning. Our VE team assembled to conduct the last scheduled licensing session for the year. They were pleased to report that Brian N9BSW successfully upgraded to Extra Class. They also have plans to assist with licensing at the conclusion of a couple upcoming Scout Technician Class license classes. This has been a successful year for the VE team with 31 people attending our free testing sessions. We presided over six test sessions and issued 33 element exams, of which 27 were passed. 22 of those tested were Scouts or leaders. Many thanks to all those who’ve volunteered with this effort. At the same time that the VE team was preparing for the test session we had an away team headed up to Cary Camp in Lafayette. This camp is part of the Sagamore Council and was host to the Area 6 Venturing Crew conference. There were Crew members there from all over Indiana and as far as Cincinnati, OH. Think of this as a camporee for Venturing Crews. We estimated there were at least 50 kids in attendance. 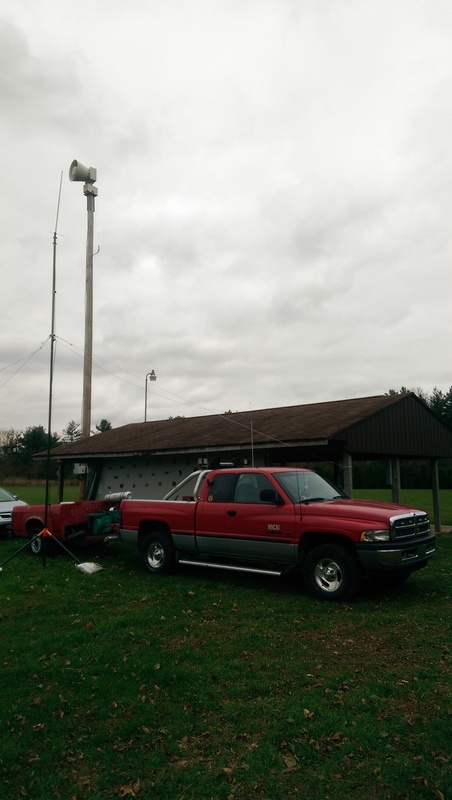 The first order of business was to erect a mast and prepare to check-in to the annual Simulated Emergency Test using the local ARES repeater. Some of the kids helped Tom accomplish this task. I was still driving at the time so I was able to check-in as mobile. The Crews were all split up and to form three groups. This allowed them to intermingle and make new friends as they competed in their activities–something different than what I’ve been used to at Boy Scout camporees. 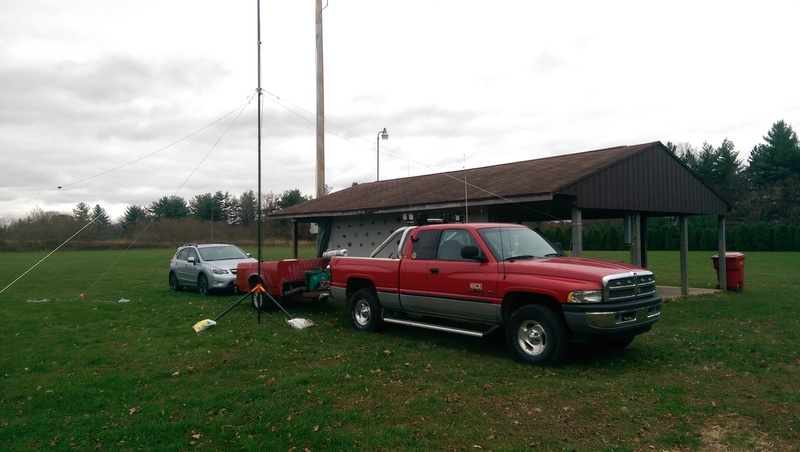 The amateur radio demonstration station was one stop on their way through the various activities. Tom provided several battery powered field stations to display and also had the mobile command unit (aka big red truck) to show off. After lunch we raised a short windom-style antenna to make some HF contacts. We had several adults and kids come back through to check that out, too. We were able to get a lot of good feedback and information for the future Venturing Crew we hope to start. Two boys expressed interest in joining it. I think we hooked them when we put them on the air with a station in Venezuela! We also made a few other stateside contacts but limited our contacts so as to save batteries for the whole day. Our next order of business will be to have an open house where we can hopefully recruit enough kids to charter our own crew. Wouldn’t it be great if we could be Crew 7373 or some such! Our final activity was the monthly station open hours held on Sunday from 2-7 PM. We hope that this can become a regular meeting time and location for the Crew. Our next open hours will be held December 14. The upcoming open house is still TBA. We’re looking forward to finishing up an excellent 2014 at the station. Be sure to spread the word anytime you can about the station. Our success in 2015 will rely on it. Our fall season at the station is fully under way. We’re back to having our regular open hours the second Sunday of the month, after a summer off. Last Sunday was our September open hours and our next will be October 12. Be sure to check the Calendar Page on this site for our monthly activities. In addition to resuming our regular schedule I’d like to remind everyone about Jamboree on the Air (JOTA). This is an international amateur radio operating even held annually for all Scouting. This year it’s held the weekend of October 19. 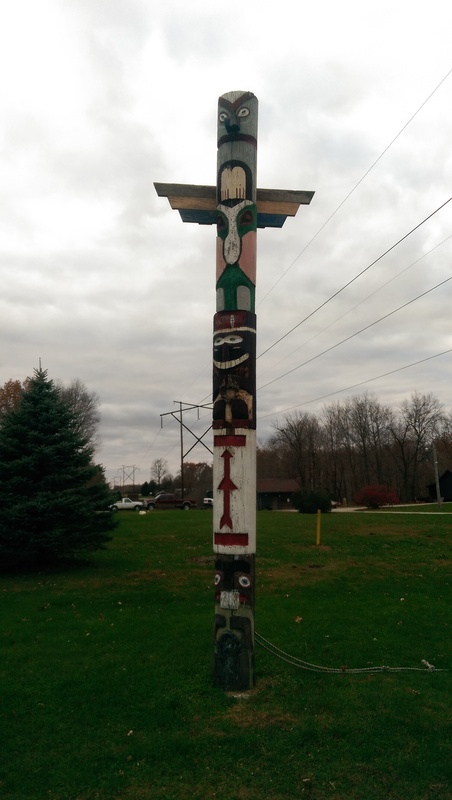 We’ll be hosting it at Camp Belzer again. All are invited to come and participate. From the chatter on our Facebook group it seems we may be assisting in some portable operations, too. 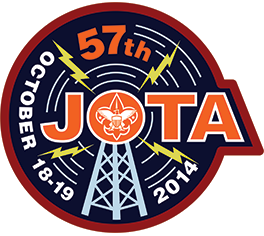 Last year JOTA coincided with a district camporee which brought in a lot of visitors. We made many contacts on multiple bands, including a few DX! Hope you all can come. A last bit of info on new station accessories. Thanks to Rex Harper W1REX and QRPme for the recent donation of three QRP radio kits. 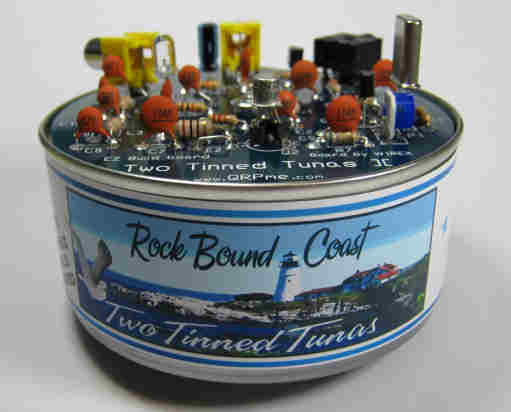 He included a Sudden Storm receiver, Two Tinned Tuna transmitter, and the very popular QRP transceiver Rockmite II. We thank them for this generous donation. 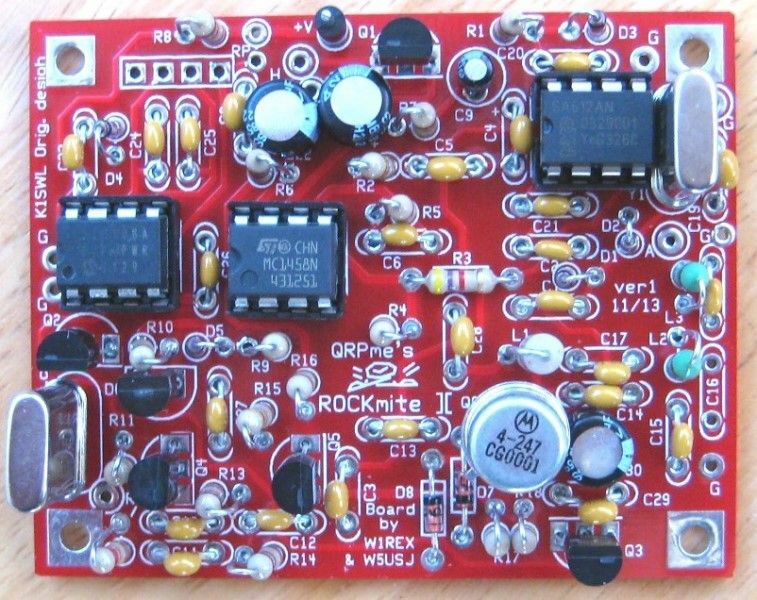 These are basic radio kits that can be built by Scouts with our assistance. Now to teach them some Morse code and get them on the air! All for now, hope to see you next month at Belzer. At the close of 2013 we were pleased to say that our VE team had tested and upgraded many hams. Of specific interest is that one of them was a Boy Scout. I’m pleased to say the Jacob KC9ZYV is still active on the radio and in his community. Our May 10 testing session added three new Boy Scouts to our rolls of Techs. Our total results for the day was two General upgrades, one person who passed Tech and went on to pass General, and three new Scouts passing their Tech. These are in addition to several others who we tested at a special licensing session at Our Lady of Greenwood. It sure is nice to see so many Scouts and leaders becoming interested in amateur radio. The next day at our May station open hours we had a couple of the Scouts and parents attend. 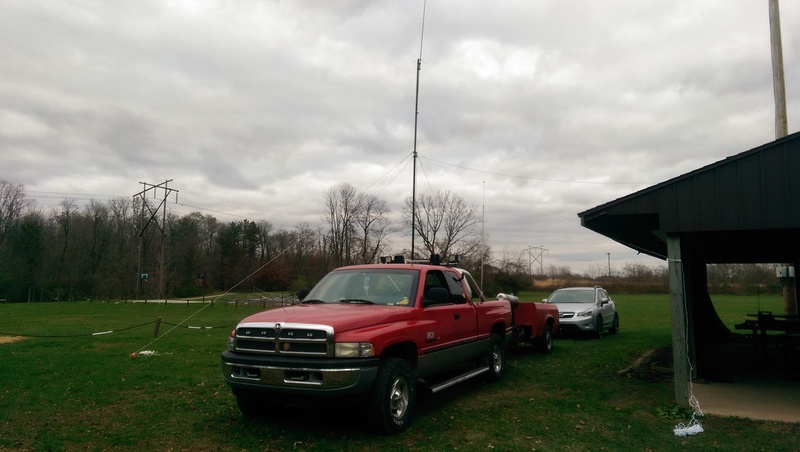 We were able to get them on the air using their Tech privileges on 2m simplex. We talked a little about how to conduct a proper contact on the radio since it was a new opportunity for them. Our job doesn’t end after licensing is over. It’s also our mission to help get the Scouts on the air and assisting them in the proper ways to conduct themselves. I know they’re planning on setting up nightly nets at summer camp to practice their skills. This would be a very useful experience. Another project we worked on was re-adjusting the antennas. One had come down partially and required shooting a new line up in the trees. Initial tests of the 160m windom were promising. There wasn’t enough time to do any real testing with the analyzer but it easily tuned with the FT-900 auto tuner. Several contacts were added to the log, included one of the W1AW portable stations celebrating the ARRL Centennial. Another change we made was to pull the Alinco 2m and Kenwood TS-530 out of the right hand operating position. Both of these radios have exhibited some intermittent issues in the past. We now have a Kenwood TM-721 dual bander in there and an SGC SG-2000 for HF. The SGC is really neat as it can operate from a remote head unit and was manufactured more like a piece of commercial radio equipment. I think it’ll make a nice addition to the station. We now have two complete operating positions at our station with radios for HF, VHF, and UHF; and antennas we won’t have to share back and forth. Looking forward to watching the station grow. This month’s station open hours was one of the most productive yet. We hosted Tiger Cub dens from two packs for their Achievement 4G: Go See It! In addition to the Tigers were also a couple Bears and some random tag-a-longs thrown in for good measure. It was a lot of fun talking to all of them on the air with the HT’s. I’m pleased to report that several boys expressed some real interest in the hobby. Several parents also asked good questions about amateur radio. Hopefully we’ll get some return guests to the station in coming months, and for our other special activities. We were also able to pull in two runs of new LMR-400 coax through the conduit and out into the woods. This allowed us to hook up the multi-band fan dipole and also a new 160m OCF dipole. The fan dipole Randy built has been pretty productive in the past, and with the new coax should be even better! The new 160m antenna was also built by Randy, and when stretched out is really long! We haven’t been able to tune it up yet, but it’s hung in the trees and will be ready for next month. The two new coax runs ate up the 500 feet roll we had but will surely be worth it. Hopefully we can say goodbye to setting off the fire alarm now. Of course, pulling the coax didn’t go without incident. As with all antenna endeavors there was adversity to overcome. The old coax came apart and much of it was pieced together and water logged. This made it hard work to get the new in and the old out. We also had to dig up some of the conduit as it had come apart underground, ugh! It seemed to take a hundred tries to get the ropes shot up in the trees using Tom’s launcher. What a long day, but happily we were successful on all accounts. The weather really cooperated and there was very little weeping and gnashing of teeth. Now that we have the new station gear and the antennas and feedline all should be well. I’m looking forward to getting the station back on the HF bands again and trying out some of the new radios. We should really have a super station now and will also have a portable go-box station for any excursions we might take. It’s nearly the end of the month now, so I better get this post published before the next big activity comes along. Next month will be exciting, too, as we host another VE testing session at the Golden-Burke Scout Center and station open hours. 73 until then.